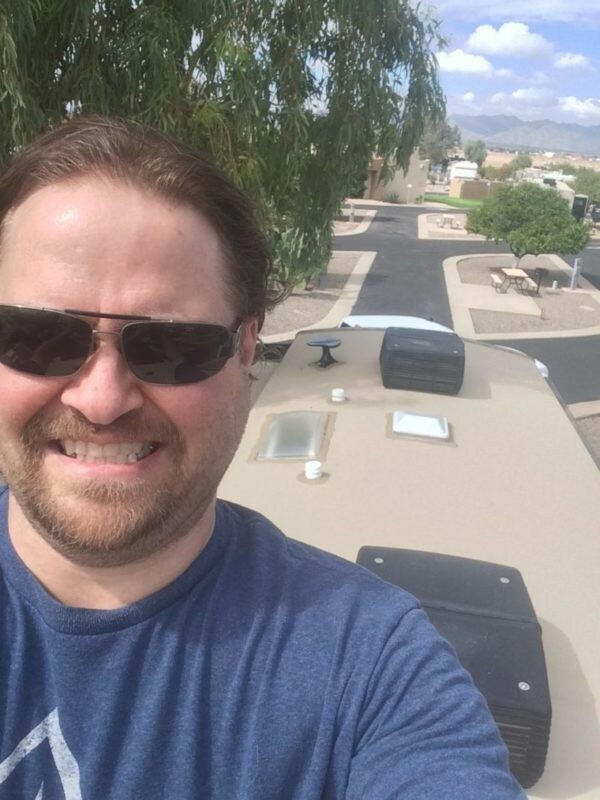 Have you thought about your RV’s roof lately? So many things can affect the life of your RV, and having a good roof is one of the most important ways to protect your RV. 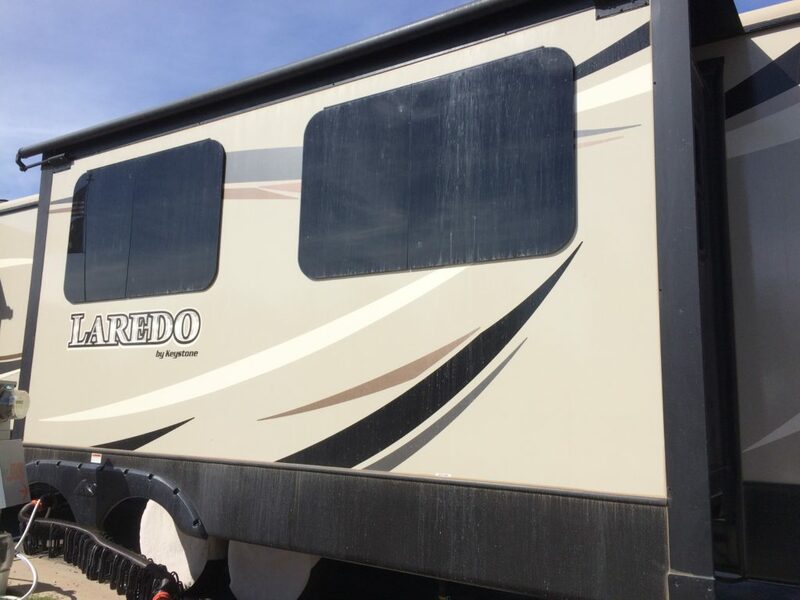 Our Keystone Laredo travel trailer has a single-membrane rubber roof, and rubber roofs need regular maintenance and protecting. We are currently staying in Arizona, so our roof has to withstand blistering sun, sweltering heat, blowing dust, monsoons, frequent bird visits, and… you get the idea. While we duck inside our RV to escape the sun, our roof is taking the brunt of it, day after day. I try to make regular trips “upstairs” to check for clogged gutters, sticks, leaves, animal nests, and droppings that might break down the membrane material. Thankfully, our unit has a walkable roof, that makes the process much easier. This week I spent an hour or so washing the Arizona dust and dirt off our roof with Dicor Rubber Roof Cleaner. I followed the label directions, and worked in 3 foot by 3 foot sections. For each section, I sprayed cleaner and scrubbed it with a soft bristle brush using circular motions and rinsing each section before moving on. The cleaner shouldn’t be left to dry on the roof, so working small sections at a time is important. The cleaner worked much better than water alone, removing dust as well as some dark spots. Be sure to rinse the dust and dirt out of your gutters and off the sides of your rig before calling it a day! If the dust is allowed to dry in the gutters, it will stick and reduce your gutter’s ability to channel water away from your roof! It’ll also stick to your windows and your roof will look wonderful, but the rest of your rig will not. At least none of this dirt is on our roof any more? While I was up there, I also took the time to wash off the tops of our slides, awnings, and inspected as many seals as I could reach. We use this Camco Slide-Out Lubricant and Protectant because it’s what was at Camping World when we were looking for some, but we haven’t compared it to any other products yet. Dicor recommends following up a roof cleaning with their UV protectant, but it cannot be applied in direct sunlight, so I waited until the evening to finish the job. I wrapped the end of my soft brush with a couple lint-free rags and worked the same pattern I used to wash the roof, one 3′ x 3′ section at a time. One spray bottle of both the cleaner and UV protectant was enough for our 33-foot travel trailer. Now that the roof is nice and clean and protected, it will be easier to maintain this on a regular basis. Next time I will also remember to put on sunscreen. PS: this post contains affiliate links to the same products we used, if you want to shop where we did. But we highly recommend doing your own research and finding the products that work best for your rig and your needs. We found Dicor’s own advice for roof products to be very helpful, and it might be a good place for you to start your own research, too.